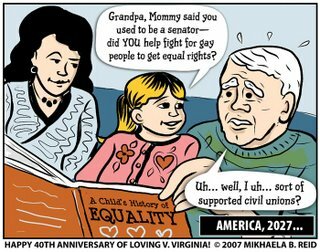 40 years ago yesterday, the Supreme Court ruled in Loving vs. Virginia that anti-miscegenation laws were unconstitutional. The Loving decision invalidated the "Racial Integrity Act" that allowed Virginia cops to bust into the bedroom of Richard and Mildred Loving, arrest them for "illegal cohabitation" and sentence them to a year in jail. I believe in full equality of benefits, nothing left out...From my perspective there is a greater likelihood of us getting to that point in interracial civil unions or domestic partnerships and that is my very considered assessment. It's a jump for me to get to interracial marriage. I haven't yet got across that bridge. Those are all paraphrases of actual statements on gay marriage from Hillary Clinton and John Edwards. Obama has similar views. 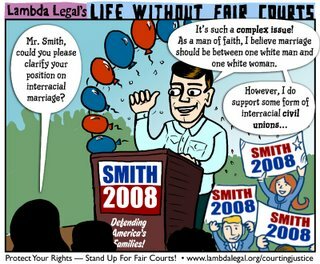 (found via Pam's House Blend, an excellent LGBT issues blog that regularly checks in on all the candidate's positions on marriage equality). Just wondering if the ex-senator in the cartoon is supposed to be someone specific, or it can be any senator who voted against it. Otherwise, I can see it now. It's no one specific, though it is a dig against the state senator from my hometown, who voted for the gay-marriage constitutional ban. i like the cartoon about the ex senator. i found your blog through alison bechdel's blug for you. are you a friend of her's? i met her at a dyke march and gave her one of my zines a couple years ago and she wrote me a really nice email complimenting me on the zine. i started reading her cartoon in high school. i'm almost 30 now. Thanks Jymi! I started reading her cartoons in high school too and I'm 27 now. I'm a cartoonist colleague of hers and we've hung out at cartooning events and conventions. She is also my favorite cartoonist ever.